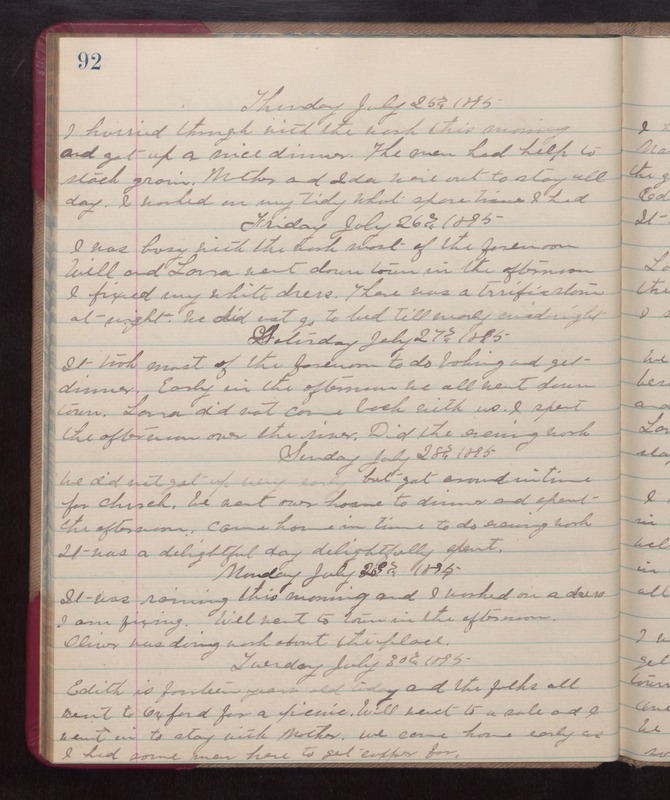 Thursday July 25th 1895 I hurried through with the work this morning and got up a nice dinner. The men had help to stack grain. Mother and Ida were out to stay all day. I worked on my tidy what spare time I had. Friday July 26th 1895 I was busy with the work most of the forenoon. Will and Laura went down town in the afternoon. I fixed my white dress. There was a terrific storm at night. We did not go to bed till nearly midnight. Saturday July 27th 1895 It took most of the forenoon to do baking and get dinner. Early in the afternoon we all went down town. Laura did not come back with us. I spent the afternoon over the river. Did the evening work. Sunday July 28th 1895 We did not got up very early but got around in time for church. We went over home to dinner and spent gthe afternoon. came home in time to do evening work. It was a delightful day delightfully spent. Monday July 29th 1895 It was raining this morning and I worked on a dress I am fixing. Will went to town in the afternoon Oliver was doing work about the place. Tuesday July 31st 1895 Edith is fourteen years old today and the folks all went to Oxford for a picnic. Will went to a sale and I went in to stay with Mother. we came home early as I had some men here to get supper for.